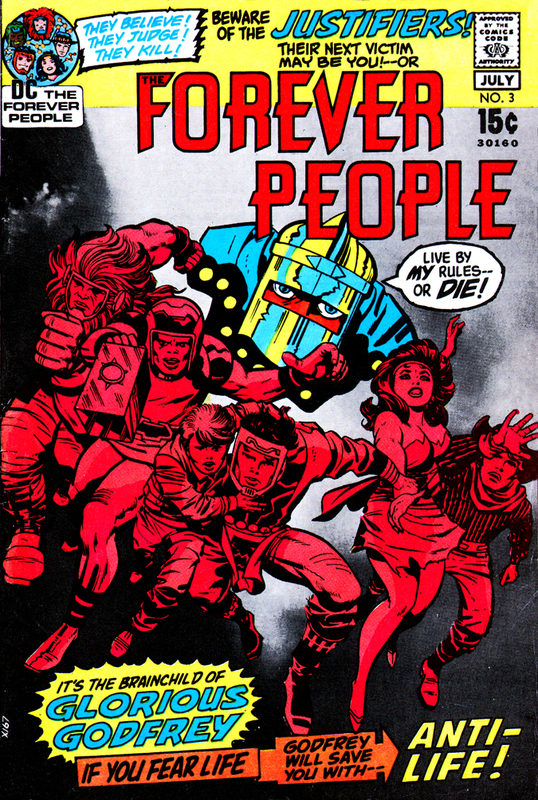 Posted 3 January 2011 in Apokolips, Day Entries, The Forever People #3, Villains. Yessir! It’s the truth! Glorious Godfrey is speaking the truth! He’s voicing what’s in our hearts! Tell it, Godfrey! Tell us how our pride is being attacked and dragged in the dust! It’s the others, Godfrey! Those who don’t think right! This is our world! Our world! They have no right to meddle with it! The one who seeks believers must be a believer himself! And such a striking and vigorous dynamo of belief is Glorious Godfrey! In a troubled, fearful world he faces his audience with his truth and fire! — Which is magnified by an awe-inspiring setting! 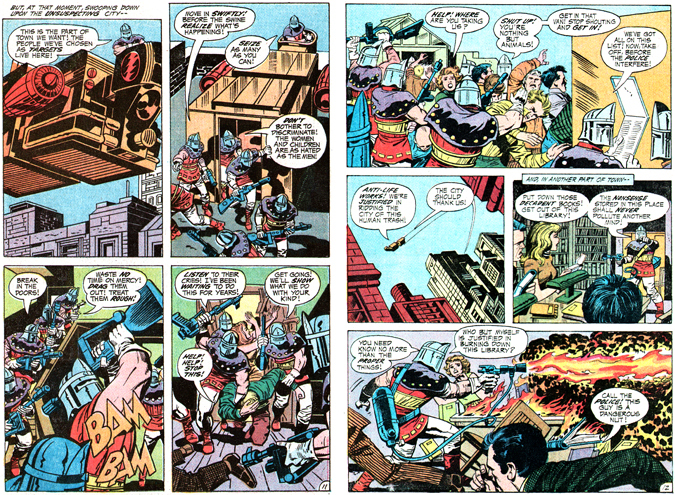 Yes, this is the arena of the vainglorious Godfrey, agent of Apokolips and auburn-haired Adonis who is on Earth to recruit an army of Earthlings in service to the great Darkseid’s cause. In the tradition of television evangelists, his sermons are at once honey-sweet and silky smooth and then sizzling with hellfire and brimstone, always asking his captivated audience to contribute. But this master of the Justifiers, this preacher of eternal death, isn’t asking for mere money from his flock; Glorious Godfrey wants his “friends” to give up their lives for the Master of the Holocaust! I hear you, right thinkers! You’re shouting Anti-Life — the positive belief! Listen, as the great organ catches your words and finds the wonderful music in them! And what am I, Glorious Godfrey, but another poor instrument that vibrates to your message? And I say, come to me! And I shall give you the power to wield death! Then we see what Glorious Godfrey has wrought on our planet as Justifiers swarm over the city performing a litany of horrors: rounding up innocent citizens to serve as tormented playthings of the malevolent Desaad; entering libraries and while decrying the “decadent” books, using a flamethrower to destroy the contents; and targeting specific merchants by painting giant “S’s” on their storefronts. Lieutenant: Anti-Life is a heady, exhilarating experience, Godfrey! They’re in ecstasy! Godfrey: Yes, they no longer think! They revel in violent emotion! They will do anything I say — in order to feed their emotion! They are now no more than zombies in my control! Video-screen Technician: Godfrey! The screen image is gone –! It now registers a moving blip! 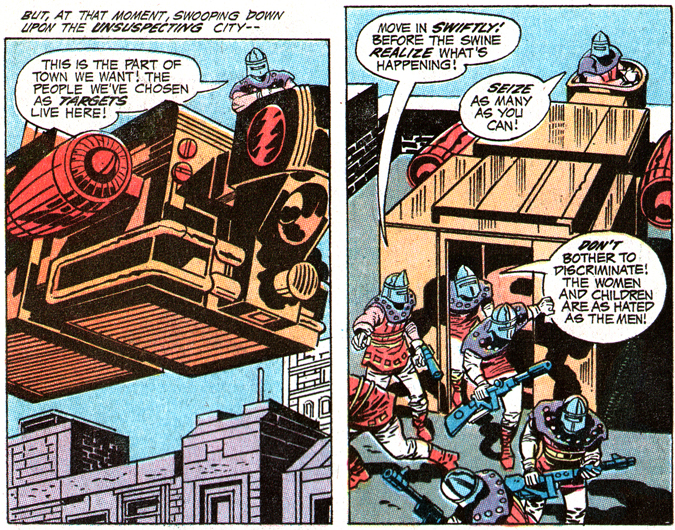 Godfrey: It can only be a phasing vehicle! We’ve got visitors not native to Earth! It seems that one of our Justifiers has failed in his mission to kill some of our opposition! I suppose they’re welcome to die here, if they wish! Our Justifiers will see to that — won’t they? Second lieutenant: As long as I command them, the Justifiers will do their duty, Godfrey! Godfrey: Well, we can’t have that sort of thing going on!! Destroy that abomination!! Justifier: We’ll volunteer for the job, Glorious Godfrey!! Give us the chance to serve you!! Godfrey: These are new recruits!! Can they do it?? Justifier: Zealots will do anything!! Just point them in the proper direction, Godfrey! 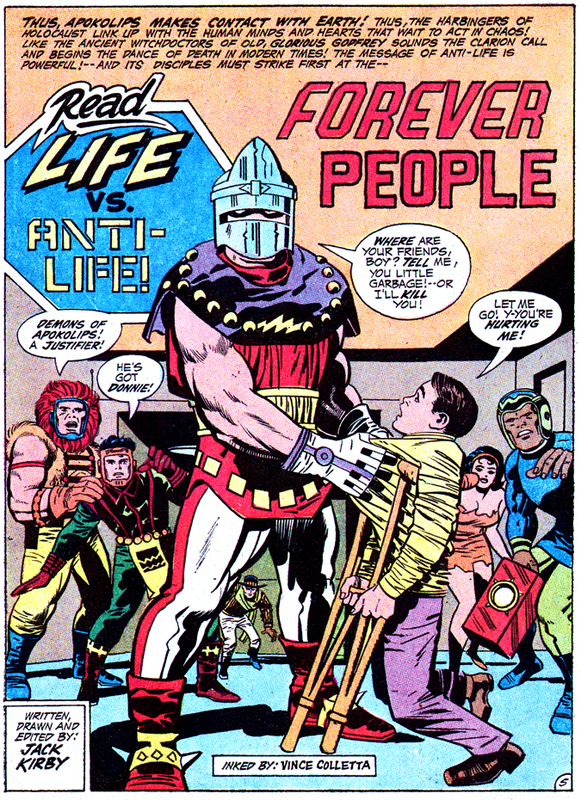 Godfrey: You Earthmen are the shining embodiment of “Anti-Life!” You leap at the throat of death — because you’re transformed!! Godfrey: Then, “To arms! !” Get your weapons and instructions!! — And finish that job!!! Justifier: Yahooo!! We’ll blast that thing into twisted junk!!! Lieutenant: They’re really eager to destroy! What’s the secret, Godfrey? The helmet? The uniform? The creed?? 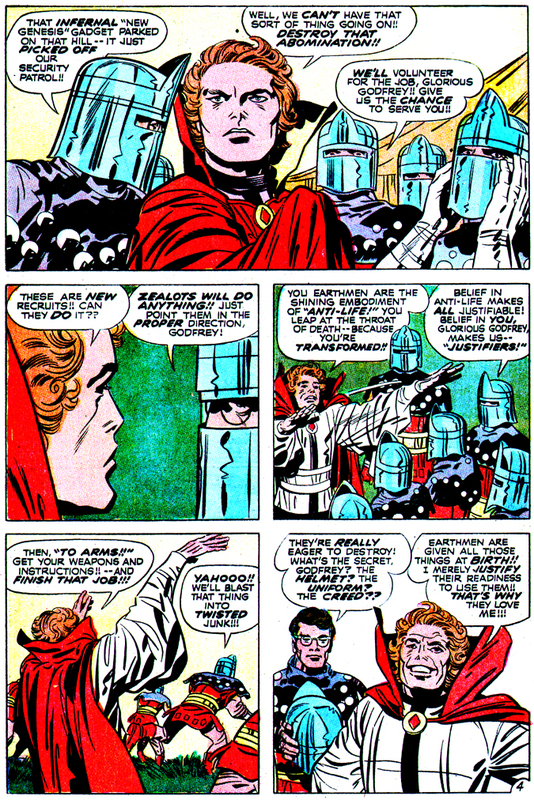 Godfrey: Earthmen are given all these things at birth!! I merely justify their readiness to use them!! That’s why they love me!!! 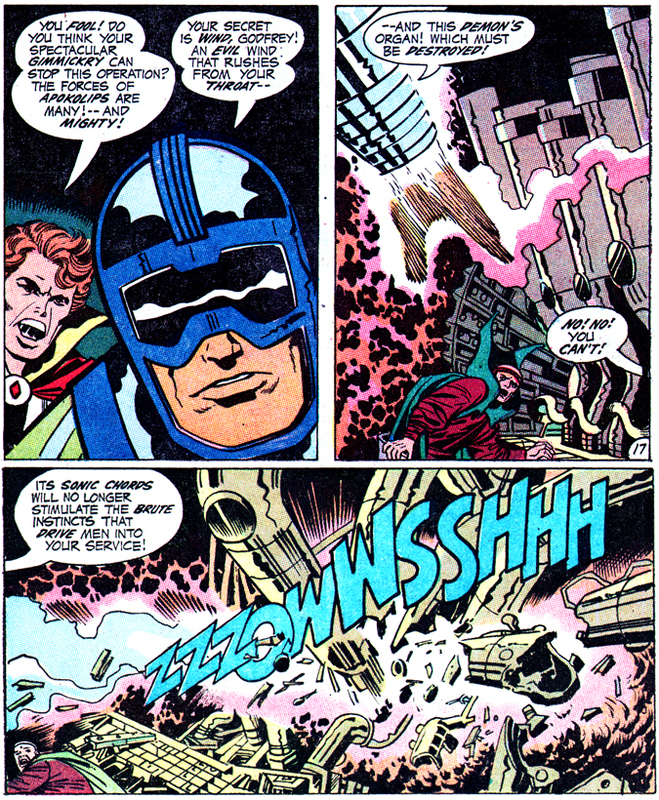 Strength is also the creed of Glorious Godfrey, who preaches Darkseid’s Revelation of Conflict!! Godfrey is neither lost in time nor space!! He is where he must be!! — At the point of conflict!! 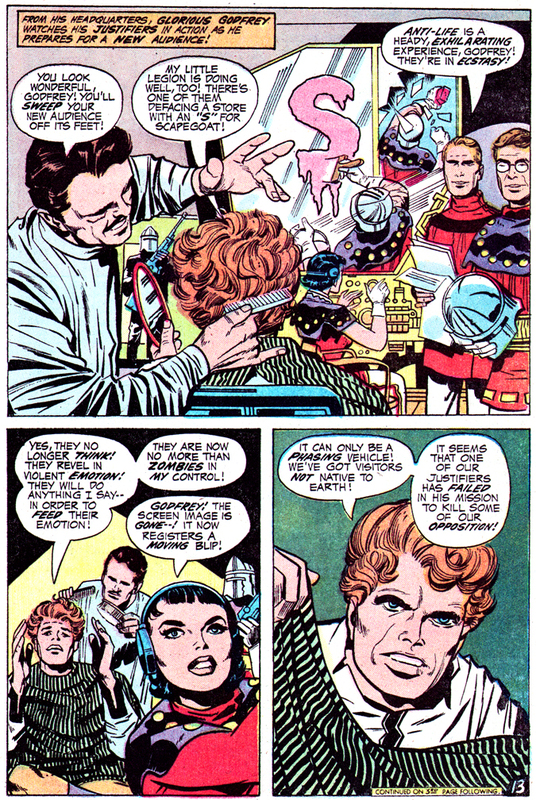 Godfrey is a captivating and particularly vile bad guy in the Fourth World and we certainly see quite a few humans of his type here on real Earth. 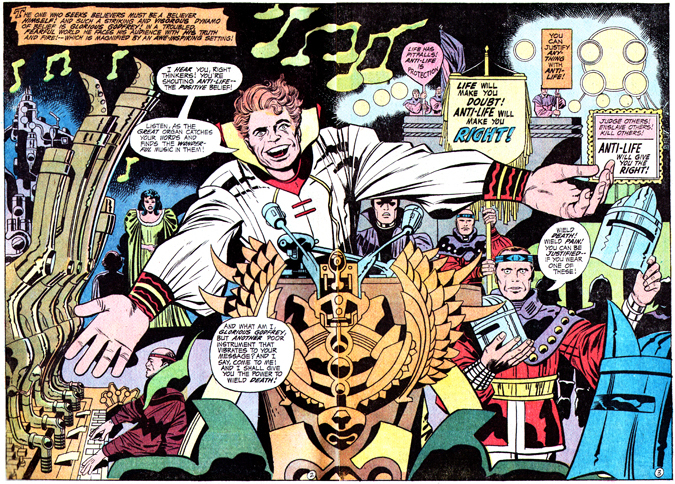 Self-important, grandiose, vain to a fault, and believing he has so many virtues he does not, in fact, possess — humility, compassion, empathy — Glorious Godfrey has no true convictions other than in himself and his ability as a salesman, seeing the quest for the Anti-Life Equation — Darkseid’s search to control all life in the universe — as merely a marketing challenge… I’m just flabbergasted and suspect strongly there’s never been a comic book villain quite like him. All hail Godfrey!! !